We’d love your help. 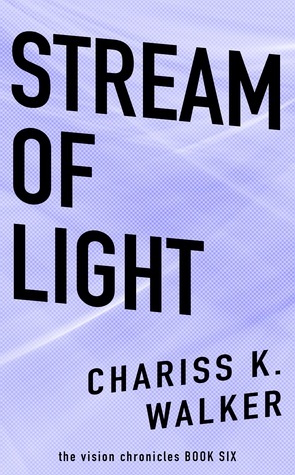 Let us know what’s wrong with this preview of Stream of Light by Chariss K. Walker. The sixth fast-paced, captivating novel in the Vision Chronicles series by award-winning author Chariss K. Walker continues the story. The illuminating visions quickly evolve as James Lewis accepts his amazing ability as a gift, but this breathtaking change has pitfalls: James struggles to keep up. Now, he sees images of the future through any stream of light, but each time his ability masterfully changes, there are remarkable consequences, dangers, and side-effects. With staggering threats on every side, can James protect his new family from those who are still after him? Stream of Light picks up where book five, Open Spaces, left off with the next eight weeks in this uplifting, slice-of-life, paranormal thriller series. To ask other readers questions about Stream of Light, please sign up. Heavens a lot can happen in 8 weeks to this "family". And for some reason James power has switched again but he has to learn how to control it while keeping everyone else semi calm at least and out of danger. But something is stopping him from "seeing" danger. You will have to read this ongoing series to find out. This is the sixth book in the series and Danny is starting to feel the miseries of being pregnant. Many close calls in the ICU and Nate Potter still harassing them. James pulls them all together. Have I said yet to buy this series? More than anything else, James Lewis desires to protect his pregnant wife and fulfill her dreams. Danny yearns for a beautiful formal wedding and a healthy delivery of the twins she is carrying. Unfortunately, like the boogey-man, the stalker always manages to te This is the sixth book in the series and Danny is starting to feel the miseries of being pregnant. Many close calls in the ICU and Nate Potter still harassing them. James pulls them all together. Have I said yet to buy this series? Stream of Light is the 6th book in this exciting and very enjoyable series. They are not stand alone books. Each book leaves you hanging, breathlessly eager for the next one. If you enjoy suspense with a touch of paranormal/metaphysical, I highly recommend this series. Chariss K. Walker, M.Msc., Reiki Master/Teacher, writes fiction and nonfiction books with a metaphysical/visionary message. All of her books are sold worldwide in eBook, paperback, and many are in large print. To learn more about this author, follow her on social media listed below. Letting Go of Pain which you can find at my website or in my list of authored books on Goodreads.